I love taking a look behind the scenes to see how our favorite celebrity designers live and decorate their homes. Today I have three fab homes for you that are sure to inspire! 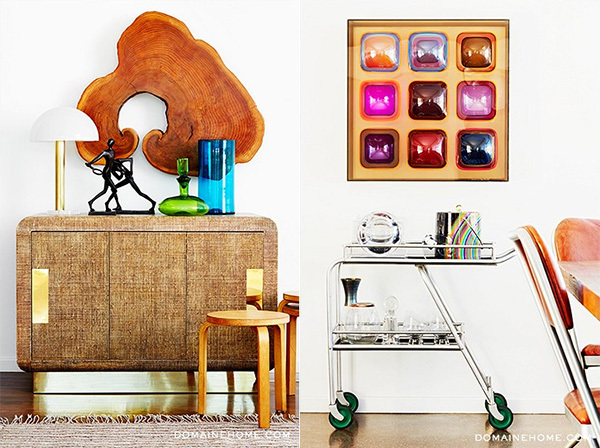 We’re touring the homes of fashion designers Trina Turk, Tracy Reese, and Lela Rose. 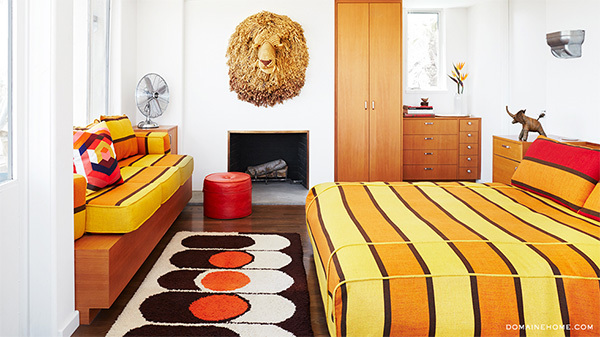 We’ll begin with the bright and creative mid-century designed home of Trina Turk. 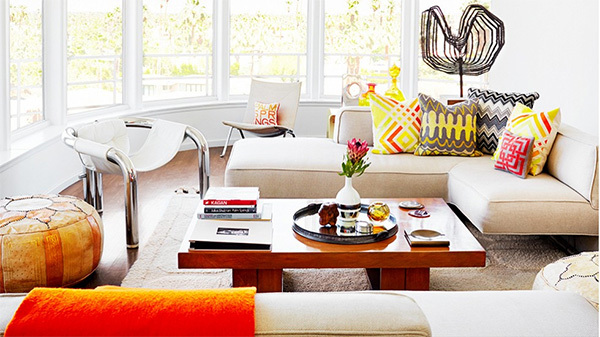 Trina’s Palm Springs home is California cool with a mod, vintage vibe. I am really loving all of her funky and artistic elements! I would definitely say that Trina’s home is a reflection of her fashion taste, which is all about the use of whimsical bright colors, but with sophistication. 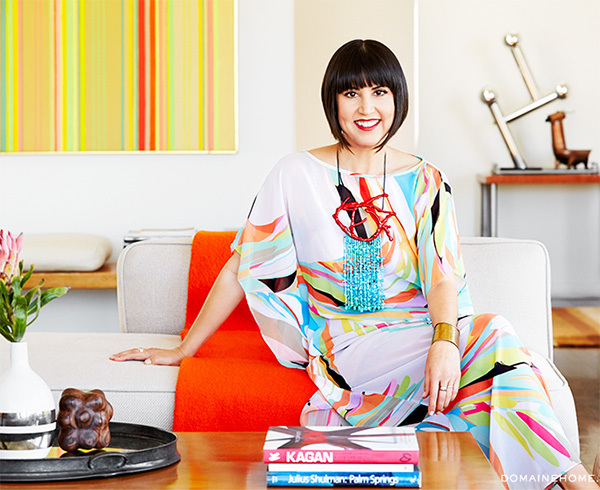 As you know, I am a lover of color as well, so I have always been drawn to Trina Turk’s fashion designs, but her home design is fantastic as well! Tracy Reese is another one of my favorite designers so I am excited to bring you a taste of both her Manhattan home and her country vacataion home. With the hustle and bustle of NYC, it’s no wonder why Tracy created a New York state country escape to enjoy with her family. Her getaway home is the epitome of casual comfort done with style. 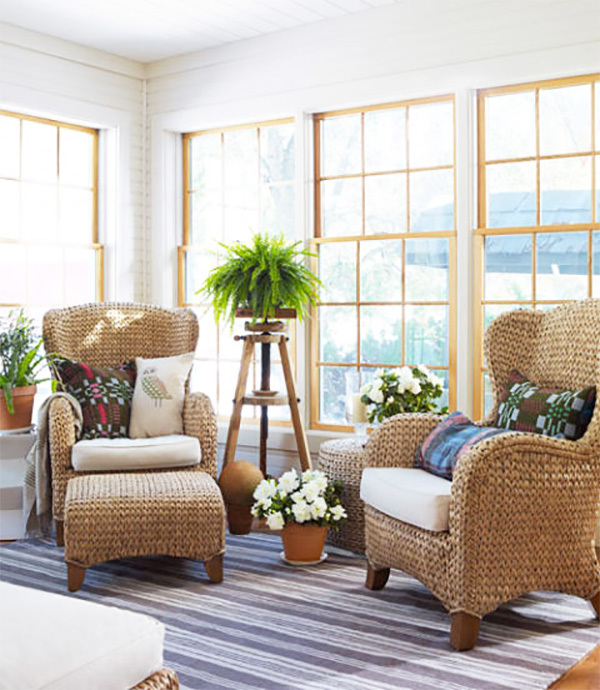 The wicker chairs and vintage flair really add to the charm of this lovely vacation cottage. Tracy’s sheepskin rug and warm pink walls really creates a cozy feel in this living room. 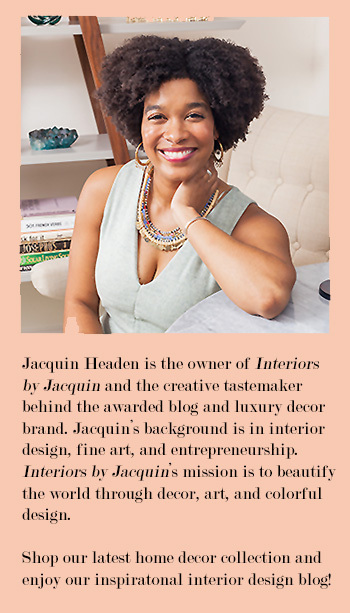 If you’d like to add these elements to your home, you can find a similar sheepskin rug here or here, and the warm pink color on Tracy’s living room walls is Benjamin Moore’s Peach Kiss. 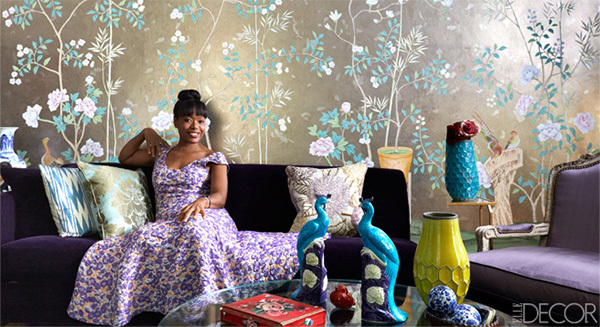 Our last photo (below) featuring Tracy Reese shows Tracy at her Manhattan home in a lovely Chinoiserie styled living room. 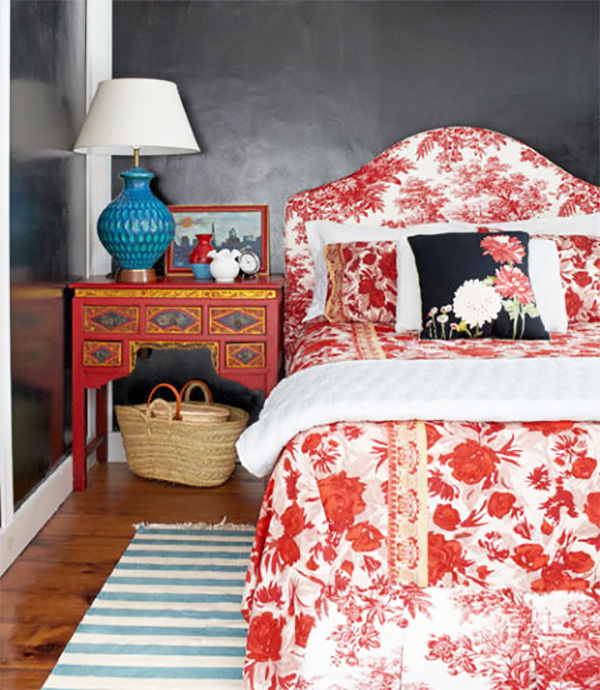 I love that Chinoiserie styled spaces have been popping up so much! She even utilizes Griffin & Wong‘s handpainted Chinoiserie wallpaper, which I mentioned in my recent post. If you want to learn more about Chinoiserie then check out my post titled Bring Chinoiserie Style to Your Home! 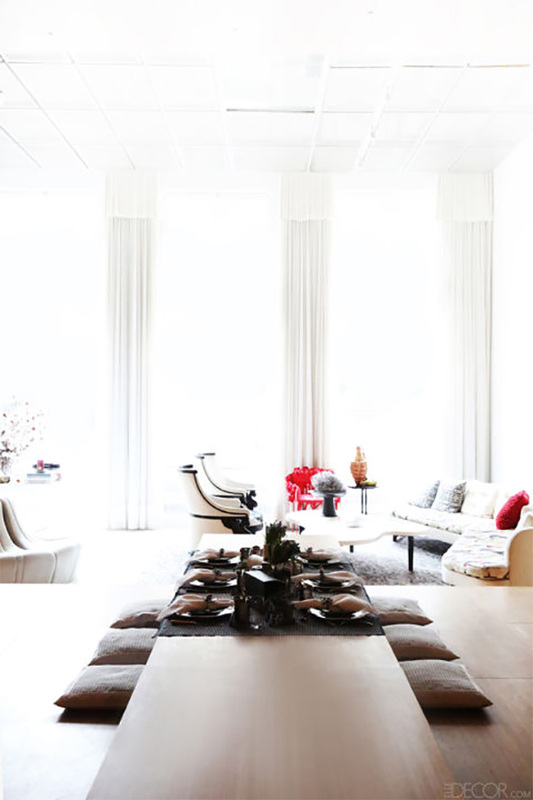 Tracy’s home is styled elegantly, just like her beautiful fashion designs for the modern woman. Last up of our fashion designers, but certainly not least, is the creative Lela Rose whose stunning wedding designs are perfect for the classic beauty. Her Ready to Wear collections are also quite stunning! I’m especially excited about her 2016 Resort Wear collection right now. There is a real depth and richness to this collection that is equally present in Lela’s home design. I also hear that Lela’s home houses a tequila room, which I must say is pretty cool too. Let’s explore. I really love the rich wood tones Lela uses in her Manhattan home. 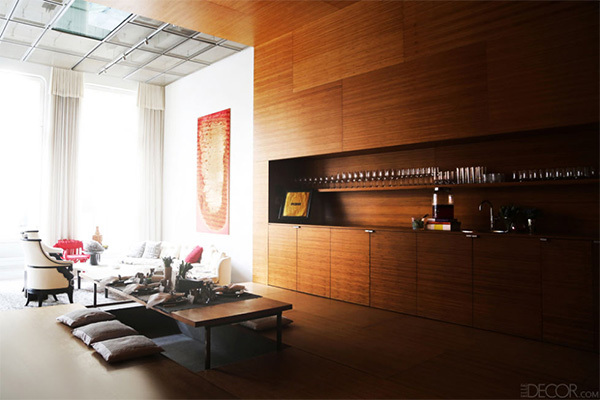 There is a global sophistication to these spaces that is both unique and inviting. See above and below. Which of these celebrity home tours are you loving the most? Have a great week!